Australia has a mixed private and public health service. The majority of childbearing women will access maternity services through the public health system. The majority of midwives will work as part of the public health system. Most births occur in hospitals attended by a midwife, less than a third of all births occur in a private hospital with an obstetrician, a small proportion occur in a birth centre and <1% occur at home with a privately practising midwife. Midwives are employed to work on a roster in a public or private hospital. Some will work in small group practices providing care to a caseload of women known as midwifery-led continuity of care, usually in the hospital or birth centre setting. An even smaller proportion will provide homebirth as part of the public system or as a privately practising midwife in their own business. Pathways to becoming a midwife include a direct entry undergraduate degree, a direct entry double degree in nursing and midwifery and a postgraduate degree designed for registered nurses. Midwifery is regulated by the Nursing and Midwifery Board of Australia, and all midwives need to be registered with the Australian Health Practitioners Regulation Authority. Newly graduated midwives have traditionally completed a transition to practice program that involves working for a specified period of time in each area of the maternity service. More recently new graduate midwives have been employed directly into midwifery-led continuity of care models. 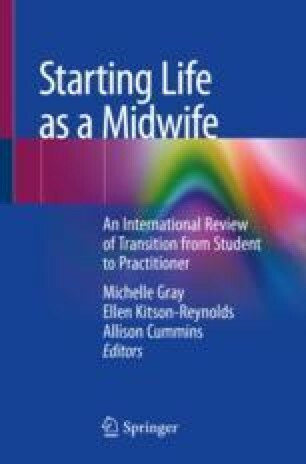 This chapter will provide an overview of the transitional journey from midwifery student to newly graduated midwife in the Australian context. ABS. Population. 2017. http://www.abs.gov.au/Population. Accessed Sept 2017. ACT Government ACT Health. Graduate midwife program 2017. 2017. http://www.health.act.gov.au/midwives. Accessed 6 Dec 2017. AHPRA Newsletter. 2011. https://www.ahpra.gov.au/Publications/AHPRA-newsletter/September-2011.aspx Accessed Nov 2014. AHPRA. Annual report 2015/2016. 2016. https://www.ahpra.gov.au/annualreport/2016/. Accessed 23 Feb 2018. Australian Bureau of Statistics. Infant deaths. 2015. http://www.abs.gov.au/ausstats/abs@.nsf/0/F41B99AB234B2074CA25792F00161838?Opendocument. Accessed Sept 2017. Australian College of Midwives. The MPR process Australian College of Midwives, Canberra. 2017. https://www.midwives.org.au/mpr-process. Accessed 12 Dec 2017. Australian Government. Mutual Recognition Act 1992 No. 198, 1992 as amended. 1992. https://www.legislation.gov.au/Details/C2013C00485. Accessed 23 Feb 2018. Australian Government. Department of Health. National Registration and Accreditation Scheme (NRAS). 2014. http://www.health.gov.au/internet/main/publishing.nsf/Content/work-nras. Accessed 14 Nov 2014. Australian Health Practitioner Regulation Agency. Approved programs of study Australian Health Practitioner Regulation Agency 2017. 2017b. http://www.ahpra.gov.au/Education/Approved-Programs-of-Study.aspx. Accessed 13 Dec 2017. Australian Health Practitioner Regulation Agency. Complaints or concerns, AHPRA Canberra 2018. 2018. http://www.ahpra.gov.au/Notifications/Make-a-complaint.aspx. Accessed 11 Jan 2018. Australian Institute of Health and Welfare. Maternal deaths in Australia 2012–2014. Cat. no. PER 92. AIHW, Canberra. 2017a. https://www.aihw.gov.au/getmedia/a8ff4563-b8f6-43b4-826e-a861522d825a/aihw-per-92.pdf.aspx?inline=true. Accessed 3 Jan 2018. Australian Nursing and Midwifery Accreditation Council. Midwives standards and criteria for the accreditation of nursing and midwifery courses leading to registration, enrolment, endorsement and authorisation in Australia, Australian Nursing and Midwifery Council. 2014. http://www.anmac.org.au/midwife-accreditation-standards-2014. Accessed 18 July 2014. Commonwealth of Australia. Improving maternity services in Australia: the report of the maternity services review. 2009. https://www.health.gov.au/internet/main/publishing.nsf/content/624EF4BED503DB5BCA257BF0001DC83C/$File/Improving%20Maternity%20Services%20in%20Australia%20-%20The%20Report%20of%20the%20Maternity%20Services%20Review.pdf. Accessed 23 Feb 2018. Government of Western Australia Department of Health. Graduate nursing and midwifery. Department of Health, Western Australia. 2017. http://ww2.health.wa.gov.au/Careers/Occupations/Nursing-and-midwifery/Graduate-nursing-and-midwifery. Accessed 6 Dec 2017.
International Confederation of Midwives. International code of ethics for midwives. 2008. http://internationalmidwives.org/who-we-are/policy-and-practice/code-of-ethics-philosophy-model-midwifery-care/. Accessed 6 Dec 2017. Northern Territory Government Department of Health. Graduate nurse and midwife programs. Northern Territory Department of Health Northern Territory 2017. 2017. https://health.nt.gov.au/professionals/nursing-and-midwifery/nursing-and-midwifery-recruitment/graduate-nurse-and-midwife-programs. Accessed 6 Dec 2017. The International Conferation of Midwives. Code of ethics for midwives. 2014. https://www.scribd.com/document/247296777/Code-of-Ethics-midwives. Nursing and Midwifery Board of Australia. Eligible midwife registration standard, Nursing and Midwifery Board of Australia 2017. 2017. www.nursingmidwiferyboard.gov.au/documents/default.aspx?record=. Accessed 12 Dec 2017. NMBA. Code of conduct for midwives. 2018a. https://www.nursingmidwiferyboard.gov.au/Codes-Guidelines-Statements/Professional-standards.aspx. Accessed 19 Dec 2018. NMBA. Midwife standards for practice. 2018b. https://www.nursingmidwiferyboard.gov.au/Codes-Guidelines-Statements/Professional-standards/Midwifestandards-for-practice.aspx. Accessed 19 Dec 2018. Nursing and Midwifery Board of Australia (NMBA). Functions of the board. 2015. http://www.nursingmidwiferyboard.gov.au/About.aspx#functions. Accessed 6 Dec 2017. Nursing and Midwifery Office. 2018 graduate nursing and midwifery transition to professional practice handbook. NSW Ministry of Health, New South Wales. 2017. http://www.health.nsw.gov.au/nursing/employment/Publications/transition-to-professional-practice.pdf. Accessed 6 Dec 2017. Queensland Health Clinical Excellence Division. Graduate nurse and midwife recruitment prospectus for 2017. Queensland Health, Queensland. 2017. https://www.health.qld.gov.au/__data/assets/pdf_file/0029/443837/2017-prospectus.pdf. Accessed 6 Dec 2017. South Australian (SA) Health. SA Health 2018 Transition to Professional Practice Program (TPPP) for Registered Midwives. SA Health, South Australia. 2017. http://www.sahealthcareers.com.au/campaign.php?id=46. Accessed 6 Dec 2017. University Admissions Centre (UAC). UAC general information 2017. 2017. http://www.uac.edu.au/general/. Accessed 12 Dec 2017. Victoria State Government. Health.vic; Victoria’s hub for health services and business. Victoria State Government, Victoria. 2017. https://www2.health.vic.gov.au/health-workforce/nursing-and-midwifery/nursing-and-midwifery-graduates. Accessed 6 Dec 2017. Worldometers. Australian population. 2017. http://www.worldometers.info/world-population/australia-population/. Accessed Sept 2017.